On the 1st of November 1914 the first ANZAC convoy left King George Sound in Albany, headed for Gallipoli. Using the earth, sea and sky as inspiration, Thylacine have designed this stunning tribute to the ANZACs who gathered in Albany prior to their deployment to World War I. 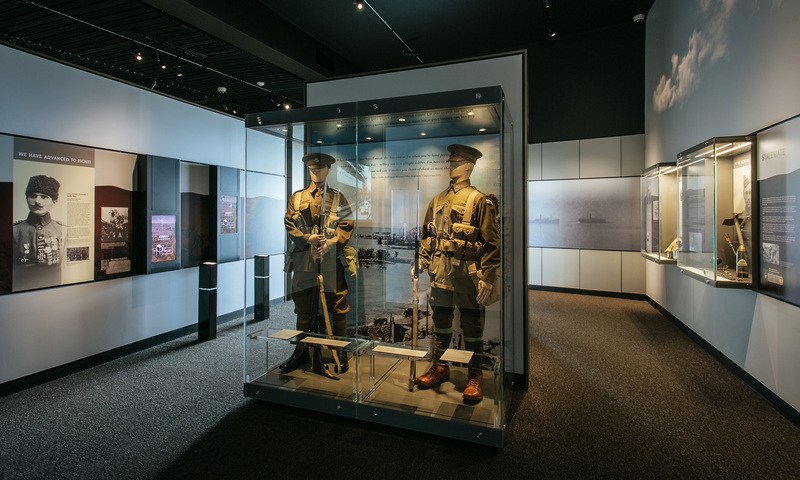 In this exhibition visitors take an immersive, media-rich journey through the history of WWI, starting in Albany with the departure of the convoys. Each visitor is assigned one of thirty-two characters to follow through the exhibition, in the form of a card with an image and name of a soldier or nurse who served in the Great War. By tapping the card at a series of stations through the exhibition, visitors follow their character’s story from departure, through the war and back home; via personalised interactive content screens. Visitors don’t find out until the end of the exhibition whether their character made it back from the war. A tribute wall at the end allows visitors to explore the journey of all the characters and send a message about their personal connection to World War I. As the content in the exhibition can be quite thought-provoking and an emotional experience for visitors, a separate space in the exhibition allows for quiet and personal contemplation. The Pool of Reflections is the centrepiece of this space, with its gently flowing water acting as a visual connection to King George Sound beyond. The names of the many men and women who departed on the first and second convoys to serve in the war slowly move under the water towards the sea on screens set beneath the surface. Project partners included the Western Australian Museum, Mental Media, Gibson Group and Illuminated Design.